The Eternal City awaits, with its layers of history. Discover its myriad fountains and palaces, its massive monuments and intimate neighborhood piazzas. Find your passion in its grandiose museums and cathedrals. See some of humankind’s biggest triumphs of creation, or explore Rome’s cobbled backstreets, art galleries, and quirky food markets. Rent an apartment in the city’s vibrant center. Sights to see: St. Peter’s & the Vatican Museum, the Colosseum and Forum, Piazza Navona, the Trevi Fountain, Spanish Steps, and countless others! 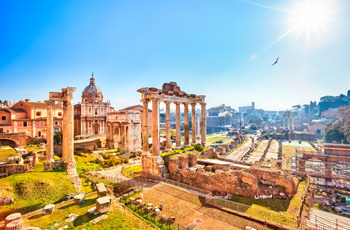 Sightseeing: Ancient Roman sites include the Coloseum, Trajan’s Market, the Palatine Hill, the Imperial Forum, the Pantheon, Nero’s Palace and the Appian Way. Visit Vatican City to tour St. Peter’s Basilica, schedule an audience with the Pope, tour the incredible holdings of the Vatican Museums, including the Raphael rooms and the dazzling Sistine Chapel with Michelangelo’s most famous frescoes. The city’s other major basilicas also beckon: St. Paul’s, Santa Maria Maggiore and San Giovanni in Laterano; nearby, pilgrims climb the Sacred Steps, said to be the ones Christ climbed. Around town, churches range from Medieval to Baroque, an incredible collection of sacred art and architecture. Explore the endless museums, from the Capitoline Museums to the Villa Borghese, the Vatican Museums to the Castel Sant’Angelo. Stroll through some of Rome’s most famous squares and linger before its beautiful fountains: The Trevi Fountain, the Spanish Steps, Piazza Navona, the Piazza del Popolo to name just a few. Day trips: Just outside the city you can visit the Catacombes. On easy daytrips you can explore the Ancient Roman port town of Ostia Antica or visit old Ancient Roman villa in lovely Tivoli. Relax on the beach in Lido di Ostia. Or take more ambitious excursions to Naples and Pompeii! Off-the beaten track treasures that can’t be beat: Linger over a cappuccino or window shop in the charming old Trastevere. Explore the historic Jewish ghetto. Stroll along the Tiber River or among the Umbrella pines of the ancient Aventino Park grounds. Picnic in the Borghese Gardens. Smaller museums showcase Etruscan and Roman artifacts, modern art, Roman history and the art of specific eras. Shop for produce at the morning market in Campo dei Fiori.